Low cost investment. Purchase with Cash or affordable monthly lease payments. High return on investment. Offer clients treatments and earn $100-300 Per treatment. 3 part cleansing process providing clients immediate results. Suitable and gentle on all skin types. A simple relaxing treatment with No discomfort or downtime. Premium water microdermabrasion with low investment cost and high return. The Aqua Peel hand piece provides clients treatments with no discomfort vacuuming dead cells and impurities away. Removal of dead cells, wastes, and epidermal regeneration are performed through chemical and physical processes, which raise and soften after hydrating during the Aqua Peel Procedure. Step 1. Exfoliating dead skin cells and cleansing pores with hydration. Step 2. For oily & acne prone skin extracting black heads, sebum, & impurities. Aqua Peel is a water microdermabrasion system using a 3 part cleansing solution exfoliation process consisting of nutrients and moisturizing ingredients to improve skin quality. The vacuum tip sprays the cleansing solution onto the skin which provides a microdermabrasion process removing the impurities, oil, dirt, and sebum from the skin providing a healthy environment for improved skin health. How does Aqua Peel work? By using a 3 part solution system washing the skin through the hand piece by utilizing vacuum technology to exfoliate blackheads, sebum, pimples, acne, and moisturizes. The treatment provides no discomfort and no downtime. Your clients will return to work and every day activates. How long is an Aqua Peel Treatment? The Aqua Peel treatment is a simple 15 minute relaxing facial. What results should be expected with Aqua Peel? Clients can expect improve dull skin, improve skin texture, reduce the size of pores, exfoliate waste, dirt, sebum, and oil. Aqua Peel treatment regulates sebaceous secretion returning to a healthy process. Immediate effects can be seen with just one procedure. There can be a redness associated post treatment but this does not last long. How much do clients pay per treatments? Market price for treatments are between $100-$300. The Aqua Peel is a low cost investment system with a high return on investment. Simple financial example, do 3 treatments a day (15 minutes per treatment) 5 days a week at $100 per treatment = $72,000 a year revenue for only 1 hour a work per day! The Aqua Peel pays for its self over and over. How much does the Aqua Peel cost? 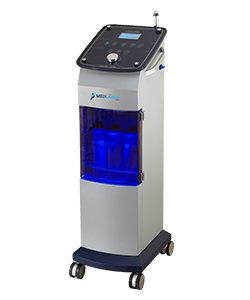 The Aqua Peel is a low cost investment for you business that yields a high return. Purchase cash in full, pay a down payment, or enroll in our zero down low monthly payment leasing program which could be as low at $225 a month! Add the Aqua Peel to your business today!